In challenging your view of architects happily colouring drawings devoid of practical nous, I do not wish to fall into the mire of more professional stereotyping by proposing that architects led the charge in technology driven, construction innovations. But I do wish to correct the impression that we sat around waiting for others to give a lead. Architects have demonstrated a capacity to put down their coloured pencils (not for good I hope), to embrace technology and new materials in progressive housing. Individual architect designed houses are little more than a paragraph in the post-war history of ‘housing’ (as opposed to ‘houses’) however the architects and the technologies which they experimented with are a different story. As an engineer you will be familiar with the constructional items selected below, but I detect less familiar with the role of architects (in brackets) who, in a fusion of creativity and practicality, made significant contributions to their development in our industry. Slip-form shuttering (Schindler/Wright), tilt slab walls (Gill/Schindler), short bore pile/beam (Krisel/ Neutra), lightweight post & beam (Wexler, Segal, Koenig, Soriano, Segal), metal windows (Tait, Rohe), Gunite (FLW/Schindler & Neutra), curtain walling (Ellis, Prouve, Wright), plywood (Wells Coates, Straub, Soriano), bent plywood (Wells Coates, Breuer, Ain), concrete (Calatrava /Candela, Lautner)…and so on. Setting aside the two modern architects you quote, neither renowned for their housing output, you share a widely held public preference for older styles over later modernism. 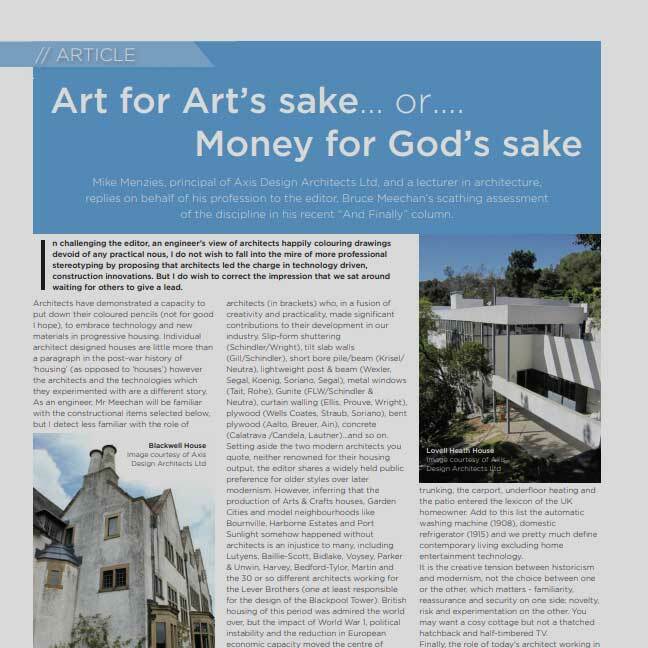 However, inferring that the production of Arts & Crafts houses, Garden Cities and model neighbourhoods like Bournville, Harborne Estates and Port Sunlight somehow happened without architects is an injustice to many, including Lutyens, Baillie-Scott, Bidlake, Voysey, Parker & Unwin, Harvey, Bedford-Tylor, Martin and the thirty or so different architects working for the Lever Brothers (one at least responsible for the design of the Blackpool Tower). British housing of this period was admired the world over but the impact of World War 1, political instability and the reduction in European economic capacity moved the centre of gravity for the development of technically innovative, low cost housing to the USA, for a time. Frank Lloyd Wright’s earlier prairie and later Usonian houses attracted many architects to leave Europe, work in his studio and latterly on the West Coast, developing new house planning ideas, constructional techniques, M+E developments, new materials, fixtures and fittings. Decades later open plan living, the family kitchen, sliding walls, composite worktops, integrated kitchens, built in closets, indirect lighting, polished concrete, multi-fold glass screens, the en-suite bathroom, dado trunking, the carport, underfloor heating and the patio entered the lexicon of the UK homeowner. Add to this list the automatic washing machine (1908), domestic refrigeration (1915) and we pretty much define contemporary living excluding home entertainment technology. It is the creative tension between historicism and modernism, not the choice between one or the other which matters – familiarity, reassurance and security on one side; novelty, risk and experimentation on the other. You may want a cosy cottage but not a thatched hatchback and half-timbered wide screen TV. Finally, the role of today’s architect working in housing is another discussion, but is, in summary, to create housing solutions on increasingly difficult sites, in numbers dictated by market forces, to a client’s specification, in a style approved by the client and wider public, laid out to mandatory quality standards, detailed to meet Building Regulations, constructed to minimise energy and carbon costs in materials doing little or no harm to the planet while all the time hoping the result will improve the quality of life of its users. It is a wonder that we have time to colour up any drawings.